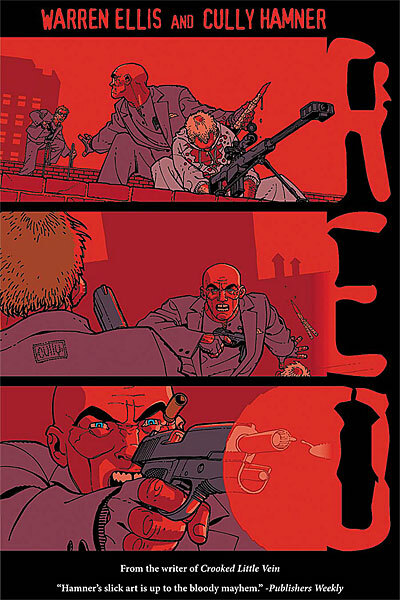 In Warren Ellis and Cully Hamner’s Red, Paul Moses is a monster. The former CIA operative who can’t escape the memories of the acts he did in the name of his country doesn’t look like a monster. Hamner draws the man rather nondescriptly; it’s difficult to pin down his age just looking at him. The lines in his face and his cold eyes are easily as much due to experience as they could be to age so it’s shocking when later in the book, Ellis and Hamner imply that Montgomery pulled the trigger in Dallas in 1963 under the orders of the Agency. Here is a man who has been around. By his own definition, he’s a true man, not one of these boys who runs the CIA nowadays. The acts that made him a man are also the ones that he’s being hunted for now as a new CIA Director is shocked after learning about the existence and atrocities that Paul Montgomery performed in the name of the United States of America. There’s not much of a story to Red but that doesn’t mean that Warren Ellis hasn’t created a story. Red is a taut book as Ellis writes no more and no less than what he needs to. The banging of the midnight thunder reminds Moses of the guns he’s fired over the years. “I am haunted by everything I have done,” he tells the CIA deputy director while he holds a gun to the CIA director’s head. “I have shot women in the back. I’ve blown men’s brains out over their wives. I’ve made children watch their parents bleed out in the street.” These are Paul Mose’s sins and even he knows the horrors that exists behind those actions, no matter who ordered them. This is also the man who gets simple pleasures in waiting for letters for his niece or innocently flirting with his CIA handler. He isn’t an evil man but he most certainly has done evil things. That is all we really get to know of Paul Moses and all we need to know of the man. There’s no back story about how Moses was recruited by the CIA, no revelations about why he was such a killer, no crying over the love he didn’t get from his father and no general exposition that may have given the reader a false feeling that they know Paul Moses better than they do. Ellis doesn’t add anything to Moses’ character that would make him a sympathetic character and that’s what makes Moses so fascinating. He’s a true stone-cold killer but he’s also tried to move beyond that past and be a normal man with a normal life and normal family. Ellis creates that tension in Moses as he does not try to tip the balance by making Moses a repugnant or sympathetic character. He is what he is and Ellis leaves it up to the reader to judge whether he is the hero or the villain of the story. The most important thing that you learn about Moses isn’t through his words but through his actions. Ellis leaves the biggest reveal about Moses to Cully Hamner’s art, allowing Hamner to subtly reveal Moses’ character. It’s an easy fact to miss but Hamner shows just how deliberate and exact a killer Moses really is. Almost every kill in this book, and there are a lot of them, are head shots. Whether Moses is pressing the barrel of his pistol right into someone’s forehead or if he’s in a distant treeline with his sniper’s rifle, each and every shot is a killing shot. He wasn’t exaggerating when he said, “I’ve blown men’s brains out…” That even lends more credence to the idea that Moses killed JFK. It fits in perfectly with his style. Red is a short, quick and unadorned story, as Warren Ellis and Cully Hamner quickly get into Paul Moses’ story and just as quickly get out of it. The true strength of Red is found once you realize what both creators aren’t telling you. Their restraint reveals just as much about Paul Moses as what they do tell you about him and his past. Going with a less-is-more approach to storytelling, Ellis and Hamner create a comic that is smarter than your average Summer action film. Or in this case, it may be a smarter your average Fall action film.